NASA and European Solar Observatory finds ISON survived after it's close encounter with Sun. Comet ISON nucleus survived and it appears in solar observatory images with iconic tail. In a previous observation, ISON appeared to be lost in Sun atmosphere but as the time progresses in the path of comet trajectory it's tail get caught in the telescopes. ISON comet behavior gives ample opportuinity to study the comet nucleus formed 4.5 billion years ago at the time of solar system formation. ISON comet originated from Oort cloud home of similar comets come to visit the Sun every year. 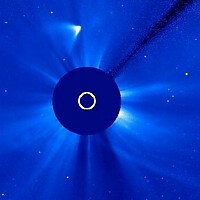 Comet ISON will be visible in the Earth sky in December 2013 with a faint tail that survived after close encounter with the Sun during the end of November 2013.